Top row from left, Michael Hayden, James Comey, Andrew McCabe, and Susan Rice. Bottom row from left, Peter Strzok, Lisa Page, Sally Yates, James Clapper. WASHINGTON — President Trump on Wednesday acted on a threat and revoked the security clearance of former CIA director John Brennan, citing a constitutional responsibility to protect classified information. Brennan, who served in the Obama administration, had retained his security clearance, as is custom, but had also become an increasingly sharp critic of Trump’s. 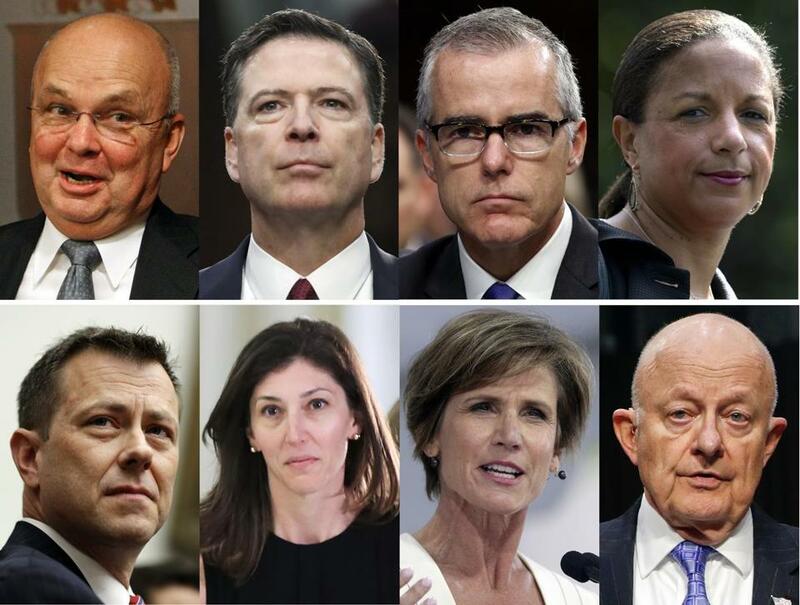 Trump says he is reviewing security clearances for nine other individuals: James Clapper, James Comey, Michael Hayden, Sally Yates, Susan Rice, Andrew McCabe, Peter Strzok, Lisa Page, and Bruce Ohr. Some have been publicly critical of the president, while others are linked to special counsel Robert Mueller’s investigation into Russian election interference. 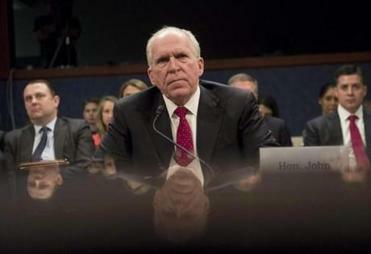 In a written statement, Trump cited ‘‘erratic conduct and behavior’’ by President Barack Obama’s CIA director as justification for revoking Brennan’s security clearance. Trump also accused Brennan of ‘‘lying’’ and ‘‘wild outbursts.’’ At a news conference last month in Finland, Trump stood alongside Russian President Vladimir Putin and openly questioned U.S. intelligence agencies’ conclusions that Moscow tried to influence the 2016 election in his favor. Trump also seemed to accept Putin’s denials of Russian involvement. President Trump’s move was unprecedented and came against a former top US official who has been vocally critical of him. Clapper served Obama as director of national intelligence and has held key positions in the U.S. intelligence community. He has been critical of Trump and told CNN on Wednesday that he has no plans to stop speaking out when he’s asked for his views on the Trump administration. ‘‘If they’re saying that the only way I can speak is to be in an adulation mode of this president, I’m sorry. I don’t think I can sign up to that,’’ Clapper said. Trump fired Comey from his post as FBI director in May 2017 over the bureau’s Russia investigation. Comey had also announced in July 2016 that the FBI would not recommend charges against Democratic presidential nominee Hillary Clinton for her email practices as Obama’s secretary of state. Trump believes the investigation was handled unfairly because of what he alleges is political bias against him at the FBI. Comey does not have a security clearance; Trump said Comey may not be able to have it reinstated. The veteran U.S. intelligence official is a former director of the National Security Agency, principal deputy director of national intelligence and a past CIA director. He’s also been critical of the president. Hayden said last month when the White House first issued the security clearance threat that losing it wouldn’t affect what he says or writes. Trump fired Yates early in 2017 after she refused to enforce the new president’s ban on travel to the U.S. by residents of several mostly Muslim countries. Yates served in the Obama administration and had agreed to stay in the job under Trump. She also had informed the White House that Michael Flynn, Trump’s first national security adviser, was potentially compromised because of his contacts with Russian officials. Trump allowed Flynn to keep his security clearance after Yates’ disclosure but later fired Flynn, citing misstatements he said Flynn made to Vice President Mike Pence. Rice was national security adviser during Obama’s second term and has criticized Trump policies. She wrote an op-ed for The New York Times in July, saying the U.S. had ‘‘so much to lose and so little to gain’’ from the Trump-Putin summit — ‘‘given this very atypical US President,’’ she added in a tweet. McCabe is a former FBI deputy director who led the investigation into Clinton’s email practices. Attorney General Jeff Sessions fired McCabe this year after FBI disciplinary officials and the Justice Department concluded he hadn’t been candid during an inspector general investigation. Trump has alleged bias in the email investigation because McCabe’s wife, Jill, ran as a Democrat for the Virginia state Senate in 2015 and accepted a campaign contribution from a longtime Clinton ally. But McCabe didn’t become involved in the Clinton probe until after his wife’s bid for elected office. The longtime FBI agent was recently fired from the bureau, his lawyer said this week. Strzok had worked on the Mueller investigation but was removed after anti-Trump text messages that Strzok exchanged with an FBI lawyer became public. Trump has used the text messages to buttress his claims that the FBI is biased against him. Page is the former FBI lawyer who exchanged anti-Trump text messages with Strzok. Trump has begun referring to Page as the ‘‘lovely Lisa Page’’ in his tweets about the Russia investigation. The Justice Department official has come under Republican scrutiny for his contacts with Glenn Simpson, cofounder of Fusion GPS. The opposition research firm hired former British spy Christopher Steele during the 2016 U.S. presidential campaign to compile a dossier of information on Trump and his ties to Russia. Ohr’s wife, Nellie, worked for Fusion GPS during the campaign — a fact Trump has tweeted about in recent days to highlight his assertions of political bias as motivation for the Russia investigation.